THE TDI CCR PREFLIGHT CHECKLIST HOLDS THE ESSENTIAL STANDARDISED STEPS THAT MUST BE COMPLETED FOR SAFETY ON A REBREATHER DIRECTLY BEFORE ENTERING THE WATER. After assembling a rebreather based on the manufacturer’s recommendations using their check list, the rebreather may sit turned off while in transit to the dive site. 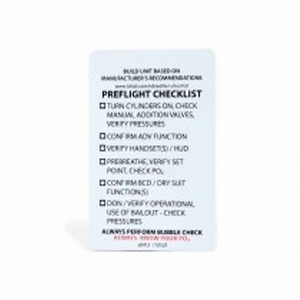 This “preflight check list” adds a short sequence to go through in order to make sure necessary components of the unit are on and functioning directly before entering the water. The TDI CCR Preflight Checklist can increase diver safety by making sure the user does not skip vital steps before entering the water. The TDI CCR Preflight Checklist is printed on a TDI Diver Cert Card and is hole punched so it can be tied directly to your gear for ease of use.